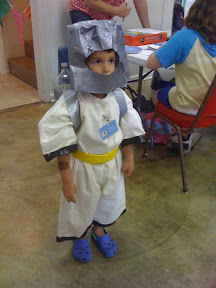 Figuring out how to make an astronaut costume on the cheap for a homeschool class turned out to be a fun exercise. 1. Find a 'helmet size' bucket or basket. This will be your mold. 3. Using duck tape in the color of your choice, tape all over the plastic bag. 4. Using regular scissors, trim around the bottom of the helmet and remove the helmet from the basket. It should lift off easily since the tape stuck to the plastic bag, not the basket. 5. Cut out the faceplate. 6. Give it to your favorite Jr. Astronaut. Oh, and while you have that duck tape out, go get two 2-liter soda bottle to make a set of oxygen tanks.